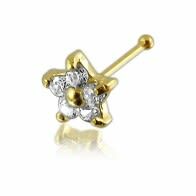 We have one of the most highly acclaimed 14k gold nose pins collection in our gold jewelry line. 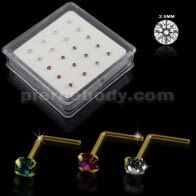 When you shop with us, you remain assured of the quality and price. 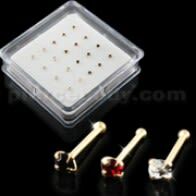 We have nice nose pin in gold assortment like 14k ball end, 14K screw, 14K diamond, 14K L- shaped nose pins and 14k nose pins available in mini box. 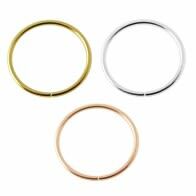 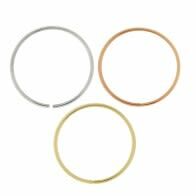 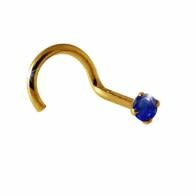 Gold Nose Pins come across as the perfect blend of traditional jewelry and modern day piercing choice. 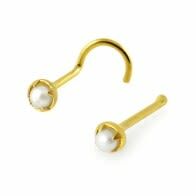 The pins have a bit of vintage charm—in some cultures; they have been worn for years. 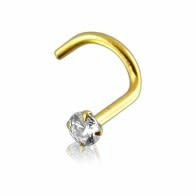 As a piercing, Gold Nose Pins are perfect for those who are apprehensive about more penetrative or bigger piercings. 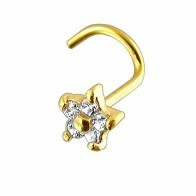 In terms of fashion appeal, they have a slight bias towards women though men too have been seen sporting Gold Nose Pins. 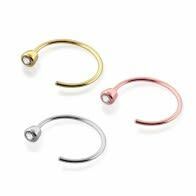 You get the perfect Nose Piercing option, neither too loud nor too risky. 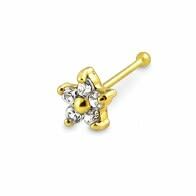 Further, the use of high-quality gold makes these Nose Pins more durable, lustrous and captivating. At Piercebody, you get the guarantee of 100% genuine Gold Nose Pins, available in the wholesale mode. 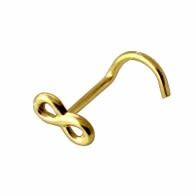 For some, Gold Nose Pins are an essential part of their overall attire not a fashion accessory while some use it as an easy fashion accessory with an eternal appeal. 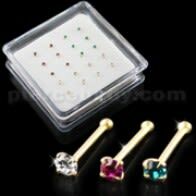 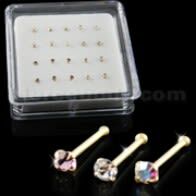 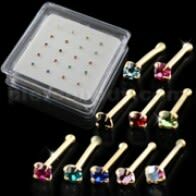 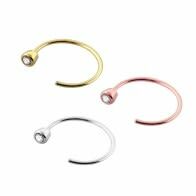 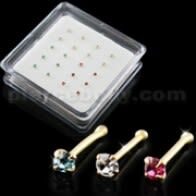 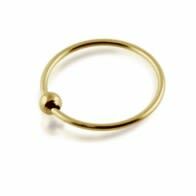 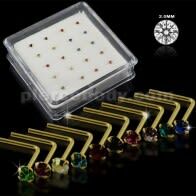 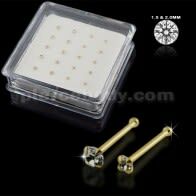 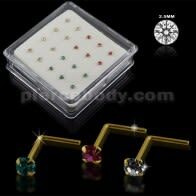 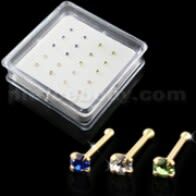 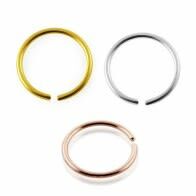 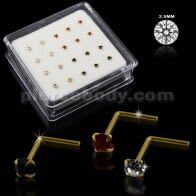 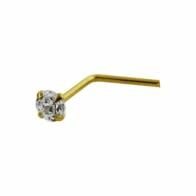 14K Gold Ball End Nose Pins: At Piercebody, you get the finest range of gold ball end nose pins. 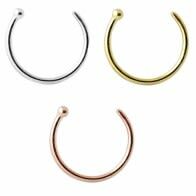 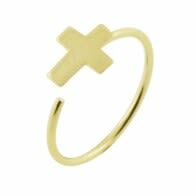 These are stylish, polished for beautiful, flawless finishing, very modern and can be worn for a lifetime. 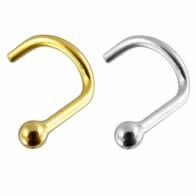 End Nose Pins don't get easily dislocated. 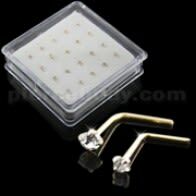 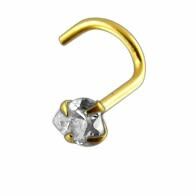 This is a very premium piercing option where we craft nose pins from genuine 14K gold. 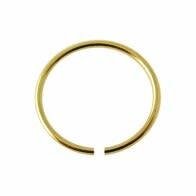 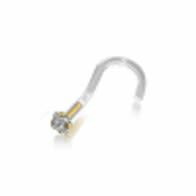 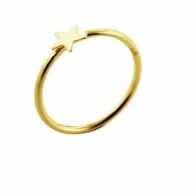 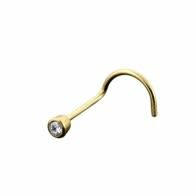 14K Gold Screw Nose Pins: Gold Screw Nose Pins is among our most popular range of nose pins where you get the promise of premium quality and ease of wearing. 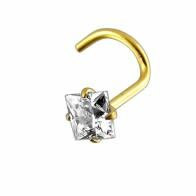 The screwing attribute makes this nose pin a very handy way to accessorize and play around with your piercing ensemble. 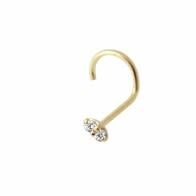 14K Gold L-Shaped Nose Pins: Piercebody is among the rare providers of L-shaped Nose Pins that are considered the current rage in this segment. 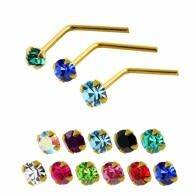 Designed in funky designs, these nose pins come in beautiful colors to suit a wider array of attires. 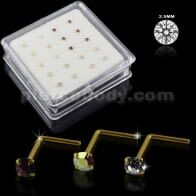 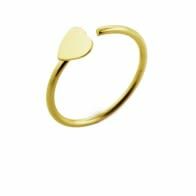 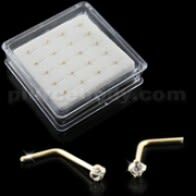 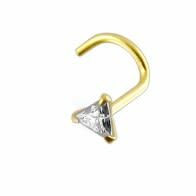 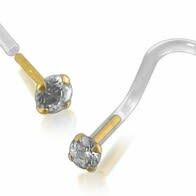 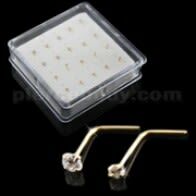 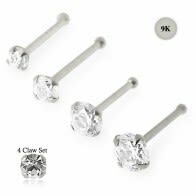 14K Gold Diamond Nose Pins: Our collection of Diamond Nose Pins is perfect for those who want their fashion accessory to outshine everything else that surrounds them. 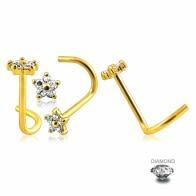 You get various options like fishtails and nose bones, each featuring a genuine, finely cut diamond. 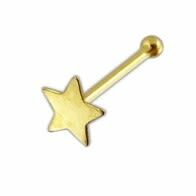 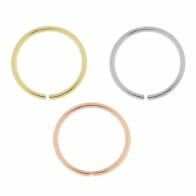 This is perhaps the most elite choice in our inventory of facial piercings. 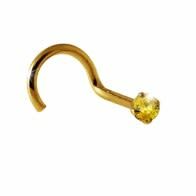 What makes Piercebody special in the niche of gold nose pins? 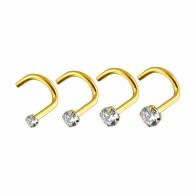 Gold Nose Pins are placed at the top of our production priority and the warehousing capacity—these are true global bestsellers simply because the type of exceptionality that is attached to them, the warm glow of gold and the purity of materials we use, come together to make these gold nose pins a majestic option among those who seek lifestyle Gold Nose Pins, crafted to perfection. 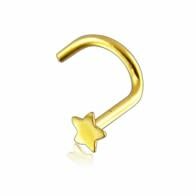 We ensure that you get high-quality gold nose pins at the best-in-category wholesale rates. 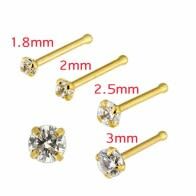 Our team of expert craftsman understands how to detail fine piercing jewelry, ensuring that every unit is a picture of perfection, something that you would cherish.